Some system designers will install two strainers with valves either side ( in the same way that you would duty / standby pumps). This allows the operator to shut one strainer off and remove the basket for cleaning, without interrupting the process flow. Clear PVC body, which allows the operator to view the mesh and decide if/when the basket needs replacing. Union ends, allowing easy fitting and, if required, removal. 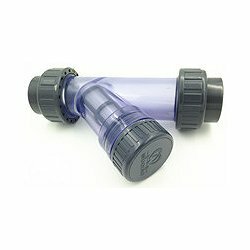 A double O-ring sealed strainer cap, which enables rapid removal and replacement or cleaning of the strainer basket. Polypropylene strainer basket - tough and long lasting.